Special Olympics gold medal-winner R.J. Franco shows off the prize after his win. More than 37,000 of the athletes participate worldwide, and can delight in and benefit from the sport even when not competing in an official Special Olympics competition. Tennis is a spring sport, with the skills competition and tournament taking place at the Special Olympics’ Summer Games. One local competitor stood high above them all in the most recent Summer Games tournament. That competitor was Ocean View’s own R.J. Franco. 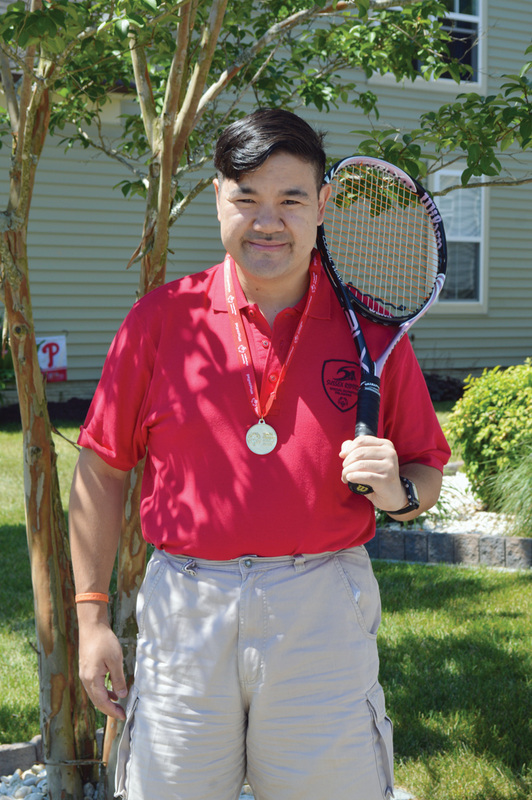 Franco took home a gold medal in the singles competition, while also winning a bronze in the unified doubles tournament with his partner, Tony Gough. The unified doubles event features a Special Olympian paired up with a peer without a disability. Carmelita and her husband, Bobby, have supported their son’s love of the sport for the past 17 years. The family had originally lived in northern Delaware near Hockessin, but there wasn’t really anywhere for R.J. to play year-round. The 33-year-old not only loves playing tennis, he also enjoys playing on his computer and watching “Jeopardy” with his parents. And his troubles with verbal communication certainly don’t hinder his ability to focus on the court. R.J. is coached at Sea Colony by Marie MacIntosh. She has been instrumental in R.J.’s development on the court, his parents said. The Summer Olympics competition allowed athletes to participate in singles, doubles, Unified doubles or the individual skills competition. All matches took place on the University of Delaware’s outdoor tennis courts. In the field of intellectual disability, the Special Olympics organization has sharpened the focus on its mission as not just “nice,” but critical — not just as a sports organization for people with intellectual disabilities, but also an effective catalyst for social change.